Primitive Saltbox House and Stars with American Flag Front Door Hand Painted Personalized Decorative Plate. 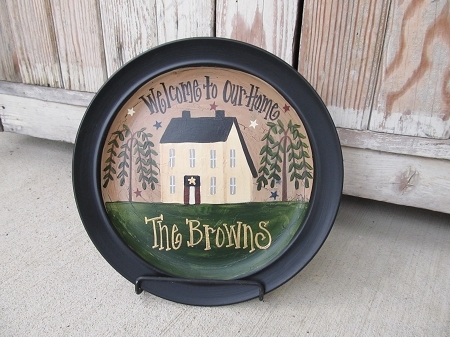 Home > Primitive Americana Decor > Primitive Saltbox House and Stars with American Flag Front Door Hand Painted Personalized Decorative Plate. Primitive Saltbox House and Stars with American Flag Front Door Hand Painted Personalized Decorative Plate. This personalized plate is perfect for the summer months or for a military family. I've painted my traditional antique white saltbox house, surrounded it with burgundy, white and blue stars and painted a flag on the door. Personalization to read as you wish. I repurpose ceramic plates so plate sizes vary slightly. Average size is 10"-11". You'll have your choice of rim colors. shown in this example is Black. Not intended for food use, decorative use only. Hand Painted, designed and signed by Heidi.